Have you lost your data? Suffering From A Hard Drive Crash? Has Your Raid Array Shut Down? Don’t Panic. You Have Found The Right Place, and you are probably eager to find out if the data is recoverable, contact us now to find out. With All The Work We Do At Tec Team, Our Number One Priority Has Always Been Your Data, It’s Important To Us That Your Data Is Safe. At Plymouth Data Recovery – Tec Team, we have been providing successful data recovery services for businesses and individuals for more than a decade. With data recovery facilities in Plymouth it’s in easy reach for an individual or business in Devon or Cornwall, we are your #1 choice for secure, fast, & confidential data recovery services in the South-West. The majority of electronic problems can be rectified and the stored data retrieved although we cannot make any guarantees. We have the facilities to scan and find data on drives in a RAW manner, meaning no file system is required. In the majority of cases this means you can get your data back. In some cases however the control data is damaged beyond repair and data extraction is not possible without complex reprogramming and rebuilding processes, most of the time we feel the cost of this work prohibits recovery. Blank screen as the hard disk is not recognised. All Hard Disks Drives have a recommended life span in terms of run hours and if in regular use will eventually fail as a result of a mechanical failure. The most common component to fail in a hard disk drive is the read/write heads. For a variety of reasons the heads fail to fly over the surface of the platters on an air bearing and will collide with the platters. The resulting collisions cause damage and failure of the head ceramic component with resulting poor definition magnetic patterning. The outcome is total failure or an accumulation of bad or corrupt data sectors. Bad or corrupt sectors will cause the computer to hang or run unacceptably slowly as the applications attempt to correct the errors. Over voltage damage power cable misplaced. Recycle Bin emptied or files were deleted in error. Forgotten or Lost Password removal from Hard Disk. Hard disks made by all manufacturers are subject to similar problems. 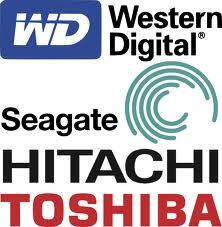 Western Digital hard disks are no more prone to developing them than any other manufacturer’s hard disk. Tec Team’s problem solving expertise and facilities offer you the best chance of recovering data from any type and manufacture of failed hard disk drives or storage media. The LaCie Big Disks are infact one or more standard IDE hard disk drives with a USB and / or FireWire interface surrounded by a metal or plastic casing. LaCie drives have become extremely popular due to the large capacity available in their range and its tough exterior. Recent drive failure figures have shown that there has been an increase in the failure rate of the larger capacity LaCie products. Datlabs have extensive knowledge of the typical problems faced by LaCie hard disk drives and would provide you with the best chance of retrieving your data. Specific files and / or directories become inaccessible and disappear. In more severe cases, the entire drive becomes inaccessible and disappears. The internal fan is susceptible to damage, and can break down due to wear and tear, the drive(s) are then prone to overheat within the casing, causing the device to fail. LaCie external disks are still prone to all the other problems hard disks suffer from ie. mechanical failure, logical failure, bad sectors etc..
LaCie frequently use Maxtor or Western Digital hard drive. Seagate Technologies Inc is the largest manufacturer of hard disk drives in the world. Seagate produce hard disk drives of exceptional quality for all user environments and performance requirements. Seagate Hard Disk Drives are reliable, robust and manufactured to high standards. Please Note: Hard disks made by all manufacturers are subject to similar problems. Seagate hard disks are no more prone to developing them than any other manufacturer’s hard disk. Hitachi are one of the largest manufacturers of hard disk drives in the world having acquired the IBM manufacturing plant. Hitachi produce hard disk drives for desktop and laptop and consumer markets. Ticking noise due to corrupt servo track or read/write head failure. Blank screen as the hard disk is not recoginsed. All Hard Disks Drives have a recommended life span in terms of run hours and if in regular use will eventually fail as a result of a mechanical failure. The most common component to fail in a hard disk drive is the read/write heads. For a variety of reasons the heads fail to fly over the surface of the platters on an air bearing and will collide with the platters. The resulting collisions cause damage and failure of the head ceramic component with resulting poor definition magnetic patterning . The outcome is total failure or an accumulation of bad or corrupt data sectors . Bad or corrupt sectors will cause the computer to hang or run unacceptably slowly as the applications attempt to correct the errors. Overvoltage damage power cable misplaced. Please Note: Hard disks made by all manufacturers are subject to similar problems. Hitachi hard disks are no more prone to developing them than any other manufacturer’s hard disk. Datlabs problem solving expertise and facilities offer you the best chance of recovering data from any type and manufacture of failed hard disk drives or storage media. Please Note: Hard disks made by all manufacturers are subject to similar problems. Samsung hard disks are no more prone to developing them than any other manufacturer’s hard disk. MPG3102AT, MPF3102AT, MPG3102AH and MPF3102AH (all 10Gb), MPG3204AT, MPF3204AT, MPG3204AH and MPG3204AT (all 20Gb), MPG3307AT, MPF3307AT, MPG3307AH and MPF3307AH (all 30Gb), MPG3409AT, MPF3409AT, MPG3409AH and MPF3409AH (all 40Gb). These Fujitsu drives will in many cases be working perfectly before then failing suddenly. They will not be recognised by the BIOS and sometimes the BIOS may identify them with nonsense information. You may see an error message telling you of a disk boot failure and also that your operating system can not be found. There are a variety of opinions as to the root cause of this failure. Fortunately, failed drives are often repairable. Do Not: Attempt to swap the controller board on one of these faulty drives with one from a working drive. IT WILL NOT WORK. This is because the information held on the failed drive is unique to each drive. Changing the controller board may very well cause a mechanical failure and render your recoverable data unrecoverable. This is quite possible. Even though these drives have an inherent fault they are still prone to all the other problems hard disks suffer from ie. mechnical failure, logical failure, bad sectors etc. As with laptop drives produced by other manufacturers, laptop hard disk drives are prone to all the usual types of hard drive failure. The drive appears to be working perfectly, then without warning, it will fail. No mechanical noise indicating failure will be heard. The drive will not be recognised by the BIOS and sometimes the BIOS may identify it with nonsense information. You may see an error message telling you of a disk boot failure and also that your operating system can not be found. Toshiba Laptop hard drives are becoming ever more popular, due to their exceptional performance, generally high reliability and ever-decreasing cost. However like all hard drive manufacturers, Toshiba hard drives can fail due to hard drive’s disk assembly unit, motor unit, damage, electrical failure, or through corruption to the drive’s operation firmware code, as well as standard user and operating system errors. Please Note: Hard disks made by all manufacturers are subject to similar problems. Toshiba hard disks are no more prone to developing them than any other manufacturer’s hard disk. Maxtor Hard Disk Drives are fast, reliable, quiet and popular. They are now manufactured by Seagate but retain the brand Maxtor. Maxtor HDD’s are installed in Desktops and External USB and Firewire enclosures under the propriety name “OneTouch” or in OEM devices such as Lacie and Iomega. External enclosures contain single or dual hard disk drives, HDD’s, with typical storage capacities of 500Gbyte, ITB or greater. All Hard Disks Drives in regular use will fail as a result of a mechanical failure. The most common component to fail in a hard disk drive is the read/write heads. For a variety of reasons the heads fail to fly over the surface of the platters on an air bearing and will collide with the platters. The resulting collisions cause damage and failure of the head ceramic component with resulting poor definition magnetic patterning . The outcome is total failure or an accumulation of bad or corrupt data sectors . Bad or corrupt sectors will cause the computer to hang or run unacceptably slowly as the applications attempt to correct the errors. Hard disks made by all manufacturer are subject to similar problems. Maxtor hard disks are no more prone to developing them than any other manufacturers hard disk.